A treasured wedding dress that is part of the Museum of the Highwood’s collection will undergo further conservation treatment thanks to a $4,000 grant from service club, Calgary’s Bow Valley Questers. 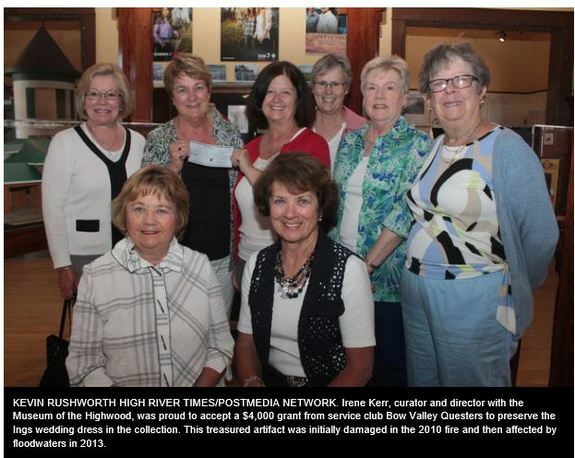 The group raised money themselves in order to be awarded the grant application, according to Questers members who were on hand to present the money to the museum on June 9. As artifacts were being carried from the flooded basement of the Highwood Memorial Centre in 2013, Kerr hunted for Guy Weadick’s hat, Flores LaDue’s boots and finally, the Ings’ wedding dress. Just as the fabric did not burn in the fire, the dress was initially washed in a rinse basin outside the Memorial Centre in July 2013, according to Kerr. More efforts are greatly needed, she said. Although it was spared from fire and saved after the flood, the grant will see the dress restored so it can once again be on exhibit, Kerr said. The dress will be repaired from its current poor state of being. “It really is one of the most beautiful things in our collection,” she noted. Constance Ings was born in 1863 and was the sister of early ranchers Walter and Fred Ings who purchased the OH ranch from O.H. Smith and Lafayette French in 1883. Fred later purchased the Midway ranch north of Nanton. After attending a boarding school in Paris, Ings traveled west with her mother from Prince Edward Island in 1887, according to the Museum of the Highwood archives. She later married William Albert Crawford-Frost on Aug. 28, 1889 in Charlottetown, PEI. The dress that is currently being restored is the same one that Ings wore during that ceremony, her first and only wedding. “After Constance got married, she moved to New Brunswick with her new husband, but of course the Ings, we have their saddles, they’re a huge part of our history,” Kerr said. Most of their life was spent in Baltimore, according to museum research. Yet, the couple lived together in Calgary, as that is where both Constance and William are buried. Ings passed away in 1954 at the age of 90. As museum staff members set into further conservation treatment on the dress, Kerr noted the important role the donation from the Bow Valley Questers will play. “We’re very grateful to them, because otherwise, I don’t know if it would ever get done,” she said. Kerr said the Alberta Museums Association (AMA) has provided much of the funding for the museum’s flood recovery team, including paying for salaries and supplies as well. Gail Niinimaa, the lead textile conservator hired to restore flood-damaged artifacts, said the additional efforts required to return the dress back to exhibit-ready quality are outside AMA grant funding. “It’s a different kind of work, not just flood work, (but) conservation treatment,” she said. Without the donation from the Bow Valley Questers service club, Niinimaa said it would have been unlikely that the dress would be fully restored. Kerr added it might just have stayed in its box. “Now we’ll (be) spraying a little more to get the silt out and we’re using an additive in the wash water to get the iron suspended into the wash solution and move it out,” Niinimaa explained about the second wash. Next, textile repairs will be completed, because the fabric is quite damaged in many parts, she added. “It does need some support, where you have the old fabric and you put new fabric underneath and stitch it, or consolidate the areas that are torn,” Niinimaa said. Now that additional funding has been secured, further conservation efforts are about to begin. It’s a project that Niinimaa estimated will take them between 100 and 150 hours to complete. As for the other textiles and artifacts being restored, the museum’s flood recovery remains in phase two of the project. Phase three is dependent on further grant funding from the AMA, she said. The artifact conservation team has operated solely on grant money, according to Kerr, and nothing has come from the museum’s budget—a fact staff members remain grateful for. On April 22, 2016, the Friends of Kinder Farm Park Historical Society was presented with a sizeable check from the Anne Arundell Towne Questers chapter (Maryland), in addition to the generous grant the group received from the Maryland State Questers. The donations to the Historical Society will be used to replace four wooden windows in the front of the restored Kinder Family farmhouse. These windows will provide greater protection for inside displays and furnishings as well as retain the wooden beauty of the original windows. Broadneck Hundred Questers previously donated a generous check to the Historical Society that provided for the curtains in the living room and dining room of the farmhouse. Their donation will also cover the cost of one additional window.